Of course, yesterday's Mega-Move on the home-front might've rightly dominated the headlines. 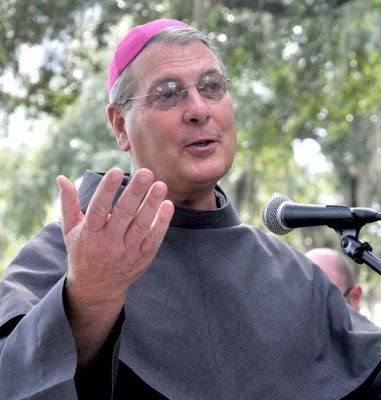 Still, it was notable that B16 cleared out both of the longest-pending openings on the Stateside docket, retiring Bishop Kevin Boland of Savannah 15 months after his 75th birthday, and naming Conventual Franciscan Fr Gregory John Hartmayer (left), 59, currently a pastor in Metro Atlanta, as his successor. The mother-diocese of Georgia, encompassing some 90 counties -- its roots dating to 1850, with the state's top half only split off in 1956 -- Savannah's 14th bishop is, like his Irish-born predecessor, an emigré to the South who's spent a significant amount of his priesthood there. A native of Buffalo with advanced degrees in pastoral counseling and education, Hartmayer worked for over a decade in the North before taking a teaching assignment in Florida in 1995, then the Hotlanta parish. While not an incardinated priest of Atlanta, the last time a cleric in the 404 was named a bishop outside it came in 1978, when then-Fr Eusebius Beltran was named bishop of Tulsa. Later archbishop of Oklahoma City, Beltran retired earlier this year. Likewise, the bishop-elect becomes the second "Black Franciscan" named to the current bench, following Bishop William Callahan of La Crosse. Hartmayer's ordination is scheduled for 18 October. With yesterday's desk-clearing moves before Rome hits high summer, seven Stateside dioceses now stand vacant, with another seven led by ordinaries serving past the retirement age.